While most of us can expect at best to gurgle away our last moments on the path to oblivion without distinguishing ourselves in that activity in any way, some individuals manage a more graceful passage. Motörhead frontman Ian 'Lemmy' Kilmister willed himself to die after he was diagnosed with the aggressive cancer that would kill him two days later, his bandmate has claimed. Drummer Mikkey Dee, real name Micael Kiriakos Delaoglou, said the singer was told that he had two months to live after medics discovered the cancer 'in his bran[sic] and neck' on Boxing Day. But in a typically rock-and-roll fashion, Lemmy accepted his fate, saying 'I've had a good run, f*** it'. This exit, a 'triumph of the will' we might call it – conscious of Lemmy's taste in Nazi memorabilia and symbolism – was a surprisingly philosophical one. It brought to mind another thoughtful exit, that of Arthur Schopenhauer 155 years ago, on 21 September 1860. 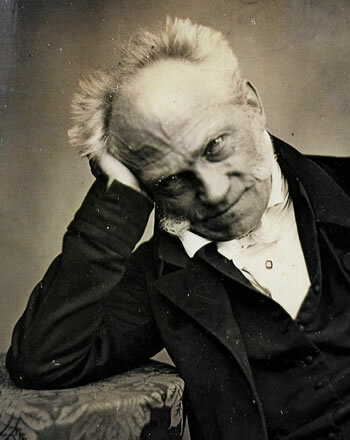 Left: Arthur Schopenhauer, waiting pensively for his morning coffee to arrive. Right: Lemmy Kilmister, waiting for who knows what. The eyes of both of them seem to follow you around. The 77-year-old philosopher breakfasted as usual, his housekeeper opened the window and left him alone. Shortly afterwards, he was found sitting on his sofa, dead, his face a placid mask. At its clearest Schopenhauer's thinking was obscure; especially dark was his theorizing about his concept of the metaphysical Will. According to Schopenhauer, at death the individual sinks back into this metaphysical Will. For our philosopher, the dying individual would see in that moment that the world was just an illusion. This moment of transition, this moment with a foot in the world of illusion and the world of reality, would be the awakening from a dream and the beginning of the sleep of death. In that awakening there is no terror and in that descent into sleep there is only calm. This moment is triggered when the restless metaphysical Will is stilled and itself wills the end of its own existence in this mortal shell. Death is therefore an act of will, or willful suspension of the will to live, if you would prefer it put in a more complicated way. Quite so, Lemmy. Yeats fans will remember the poet's belief in the Anima Mundi: an idea not a long way from Schopenhauer's metaphysical Will. With those cheerful thoughts we wish philosopher Lemmy a much deserved rest from all his heavy metal exertions and our reader(s) a happy and willful New Year. It's a tough life being a philosopher. The lonely, sad looking one on the left is clearly a linguistic philosopher, a job which is notorious for its effect on the ability to pursue normal human relationships: 'Your place or mine?'. 'It depends what you mean by "place"'. What an extraordinary love story. After 76 years of marriage, Miles and Phyllis Higgin from Burnley — who were described as inseparable in life — died just three days apart. They met at a dance in 1933, when Phyllis was 15, and married in 1939. It took a world war to separate them and they exchanged countless love letters as Miles served with the Royal Artillery. When he returned, they never left each other’s side, running pubs as a husband-and-wife team. After retiring, they’d go for walks together up to four times a day. Even when the time came to go into a nursing home, they shared a double room. Staff recall them sitting hand in hand all day long, with Miles constantly telling her he adored her. But this story is not just a touching testament to love. It also suggests something medical science can’t explain. The couple’s daughter, Angela Hartley, 66, says it had been assumed Miles — who was 99 to his wife’s 97 and had prostate cancer and lung disease — would be the first to go. But she believes he couldn’t bear the thought of leaving his wife alone and ‘waited for her to die’. When Angela first told her father Phyllis had died, it didn’t sink in. But death is a biological event with specific, physical causes. It can’t be delayed or manipulated just by wishing. Or can it? Dr. Max Pemberton, How willpower can save you from dying, The Daily Mail, 9 January 2016. Science may not be able to explain it, Dr. Pemberton, but Lemmy and Arthur can. Sorry, 'could have done' – bit too late now. ^ A tumour on the bran should never be taken lightly. 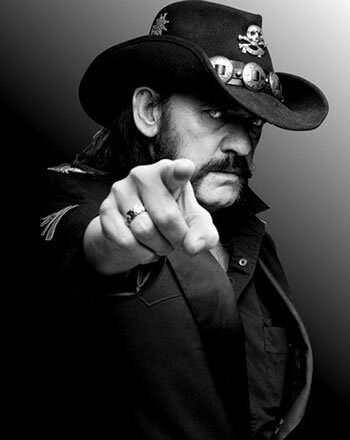 Lemmy Kilmister. ^ 'Under Ben Bulben', in Last Poems (1936-1939) in Collected Poems, Macmillan, London, 1965, p. 398.